Peter Vaughan is an English character actor, known for many supporting roles in a variety of British film and television productions. He has worked extensively on the stage, becoming known for roles such as police inspectors, Soviet agents and similar parts. He is best known for his role as Grouty in the sitcom Porridge and also had a recurring role alongside Robert Lindsay in Citizen Smith, written by the late John Sullivan. He was born Peter Olm in Wem, Shropshire and he was brought up in Staffordshire where he attended Uttoxeter Grammar School. After leaving school he joined Wolverhampton Repertory theatre and gained experience in other repertory theatres before army service. Vaughan has been married twice, on the first occasion to Billie Whitelaw. His second wife is actress Lillias Walker, with whom he lives in the village of Mannings Heath, in West Sussex, having previously lived in Crawley, West Sussex. In film, he made his debut in 1959 and continued to play small roles for several years, before gaining his first starring role in a minor picture called Smokescreen . He became known for his performances on television, including supporting roles in Porridge (as "Genial" Harry Grout) and Citizen Smith . Vaughan's role in Porridge brought him a great deal of public recognition, despite the fact that his character appeared in only three episodes and the film of the series. In 1967, he got second billing opposite Frank Sinatra in the movie 'The Naked Runner'. However, his performance was not well received by critics who accused him of overacting in his role as a British agent. In 1969, he appeared in Randall and Hopkirk in the episode "Never Trust a Ghost". In December 1972, he appeared as Mr. Paxton in the BBC television adaptation of the M. R. James ghost story A Warning to the Curious, shown as part of their annual series A Ghost Story for Christmas. Shot during 10 months in 1979, Peter Vaughn starred as Billy Fox in the groundbreaking and high budget 13-part Thames Television saga, Fox , written by Trevor Preston, directed by Jim Godard, and produced by Verity Lambert. As other Fox family members it also starred Elizabeth Spriggs, Ray Winstone, and Bernard Hill. He played Mr. Freeman in Karel Reisz's 1980 The French Lieutenant's Woman, the first star billing for Meryl Streep and Jeremy Irons. Vaughan was heard as Denethor in the celebrated 1981 BBC Radio production of The Lord of the Rings. Vaughan later attained particular acclaim for his supporting role as the eventual Alzheimer's sufferer Felix Hutchinson across thirty years of his life in Our Friends in the North , a role which gained him a Best Actor nomination at the 1997 British Academy Television Awards. He has also appeared in many literary adaptations, such as Bleak House and Our Mutual Friend . Other television work includes the espionage thriller Codename: Kyril , in a lead role as the head of the KGB. Perhaps his highest-profile film performance was as the father of Anthony Hopkins's character in The Remains of the Day . He was also cast in Terry Gilliam's The Man Who Killed Don Quixote, but had not shot any material before that project was abandoned. He had previously appeared for Gilliam in Time Bandits and Brazil. He also appeared as a memorably menacing character in Straw Dogs , with Bill Murray in a film of W. Somerset Maugham's novel The Razor's Edge and in 1997 he appeared alongside Robert Carlyle and Ray Winstone in Face. Possibly his most unusual role was as SS Oberstgruppenführer Artur Nebe in the 1994 film of Robert Harris's novel Fatherland. In 1986, he appeared in the promotional video for Kate Bush's "Experiment IV" single. In 2007, he starred in the television serial Mobile and as Uncle Alfie in the film Death at a Funeral. In 1991, he played John Turner in an episode of the Granada Television's The Adventures of Sherlock Holmes titled "The Boscombe Valley Mystery". In 2011, Vaughan starred as Michael Dodd in the BBC courtroom drama Silk. 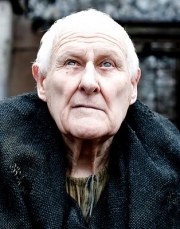 He also plays the role of Maester Aemon in the HBO series Game of Thrones. Whole or part of the information contained in this card come from the Wikipedia article "Peter Vaughan", licensed under CC-BY-SA full list of contributors here.